Finances alone do not automatically make a good retirement. Of course, your financial picture is important, but what you really want is a healthy, happy, vibrant and meaningful lifestyle. The key to a vibrant and enriching retirement is how well you plan for it. You owe it to yourself to gather as much information as possible; so you can chart your retirement course with confidence–now, when you’re zero to ten years way from your first retirement, not when you’re ten years into it. Retirement coaching can help you gain the knowledge needed to reach your personal retirement goals. Hallimah Bellows provides the most comprehensive pre-retirement planning tool available and backs it up with a powerful coaching program so that you can consider all the fantastic retirement options open to you and then make the best retirement decisions possible. Retirement is the beginning of a very new life. 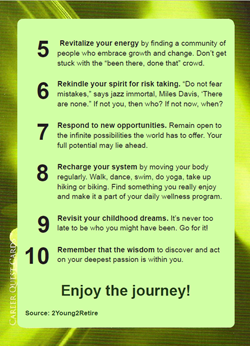 You’ll find yourself starting over again, making new friends, engaging in new activities, perhaps finding a new source of income and, most important, finding new purpose. These are huge, important changes. You’ll be faced with a lot of choices. This is the time when you need the help of a professional coach who can focus entirely on you!. Discover who you are and what really motivates you. 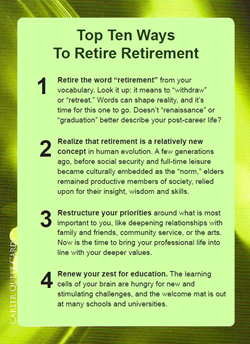 Create the new retirement life that will enable you to follow your passions, priorities and talents. Achieve the goals you have chosen on your own terms. Break out of self-defeating behaviors and get the most from retirement. Unleash the powers within you and accomplish more than you ever thought possible. You will gain a true supportive partner to guide you to the wonderful rewards to be found in achieving your goals. Halimah is certified to administer and interpret The Retirement Success Profile (RSP). 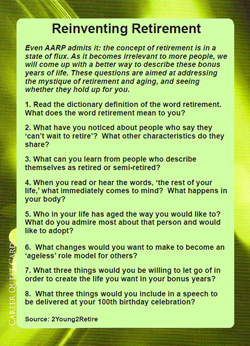 This is a scientifically designed assessment tool consisting of 120 questions that identify personal retirement strengths and concerns for people over 50 who are currently retired or planning their retirement. Are you ready for the transition from full-time work to active ‘retirement?’ You could be facing a span of years equal to your entire working life. You’re too young to retire from life, and you always will be. So what’s next? The 2young2retire course tackles key issues: life/work balance, social relationships, health, money and retirement attitude, with a focus on what’s possible. At the end of six weeks you’ll be well prepared to shape a future based on choices that matter to you. Are you a baby boomer who’d like to feel more confident and hopeful about retirement? In this introductory workshop we will look at the thoughts and feelings behind this major life transition so that you can start to work on creating a balanced and healthy retirement lifestyle. Retirement can be a time of great freedom and development, or it can collapse into just the opposite. The key to success is preparation. Come prepared to look within through exercises and class discussion. This introductory workshop is designed to help pre-retirees discover the latest trends, learn how retirement is being redefined, explore the 5 stages of retirement. 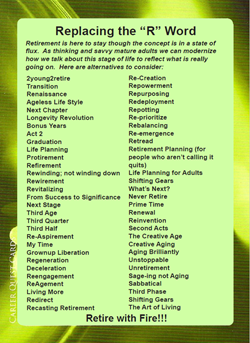 The 15 factors for a successful retirement will be introduced. Ideal as a brown bag lunch presentation. One 45-minute coaching session for each participant. Through interactive discussion, and exercises, participants will examine retirement trends, learn the 5 stages of retirement, explore the emotional and social impact of retirement, and discover how to prepare for a successful, happy retirement. Through interactive discussion and exercises, we will examine new trends and the stages of retirement, explore retirement’s emotional impact, and learn how to prepare for a successful, happy retirement. Participants will learn about the 6 Key Life Areas and the 15 Retirement Success Factors. 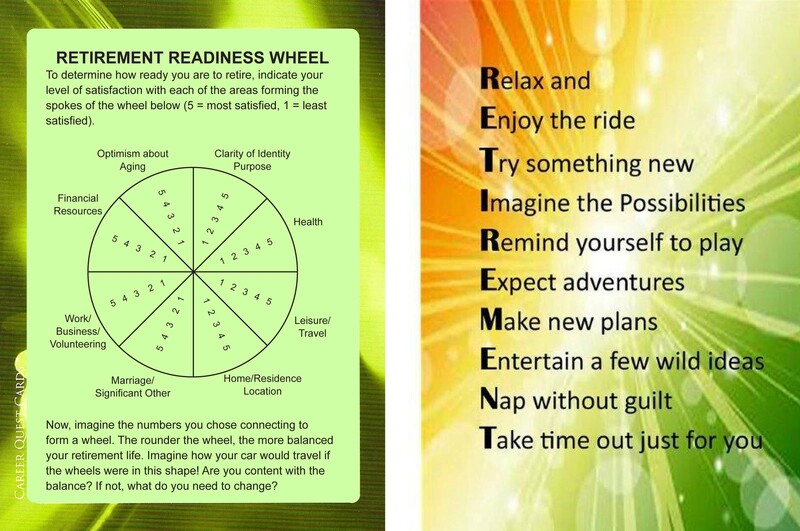 Each participant will take the Retirement Success Profile assessment on-line prior to the workshop. For some retirement ideas you may not have thought of, go to: www.careerquestcards.wordpress.com.